C.L. 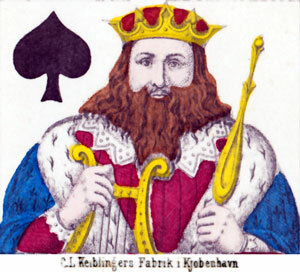 Keiblinger was a manufacturer of fine playing cards and card games (Gnav→) who flourished at the same time as L.P. Holmblad, also of Copenhagen. Trade advertisements refer to fine playing cards, optional gold edges and give his address as Balsamgade 14, 3rd floor. 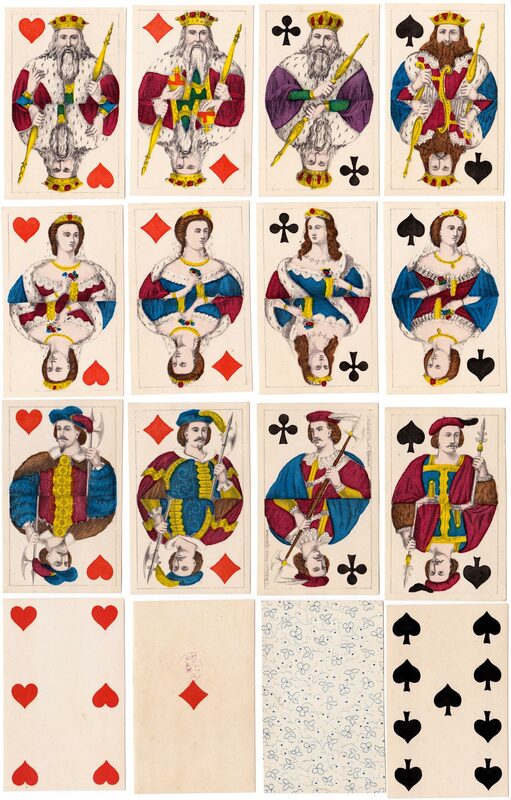 Above: double-ended, continental style playing cards manufactured in Denmark by C.L.Keiblinger, Copenhagen c.1860. The King of Spades represents David holding his harp. 52 cards, printed from engravings, hand coloured using stencils. Feint Danish tax stamp on Ace of Diamonds. Images courtesy K. Frank Jensen.